It’s that special time of year when a boy feels the need to cook everything over a flame of some sort. *sniff sniff tear* I love it when my husband gets the grill bug. This past weekend was definitely the grill bug biting weather. We did up some turkey burgers. You see the key to having a good time with turkey burgers is condiments. Condiments, condiments, condiments! Don’t you dare think a turkey burger is anything like any old beef burger. That is a big mistake. Treat it more like a gourmet object and it will give you gourmet flavours. 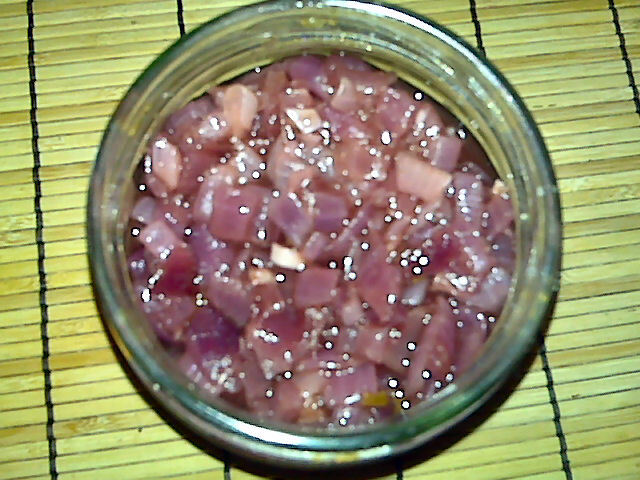 One of my favourite condiments for turkey burgers, grilled chicken, or even beef is a nice red onion relish. Combine the ingredients in a saucepan and bring to a simmer. Allow to simmer until most of the moisture evaporates and the onions soften. The mixture should thicken. This makes atleast 16 servings. Each serving is a tablespoon. If you made this with splenda each serving contains 10 calories, 0 grams fat, and 0.4 grams of fiber. Pretty awesome right? With sugar each tablespoon contains 42 calories, 0 grams of fat and 0.4 grams of fiber. Still pretty awesome. This relish is full of flavour and does well as a preserve. It’s even delicious served with a cheese platter or yes…even on that plain old burger. Go nuts and enjoy! This entry was posted in Ingredient and tagged Onion, sauce. Bookmark the permalink.